This unusual lamp has a tubular shaped envelope with electrical contacts at each end. The base at the stem end has engagement pins similar to a standard bayonet base, while the opposing end is smooth. The metal shells, which form the electrical contact at each end, are both hallow and filled with plaster. 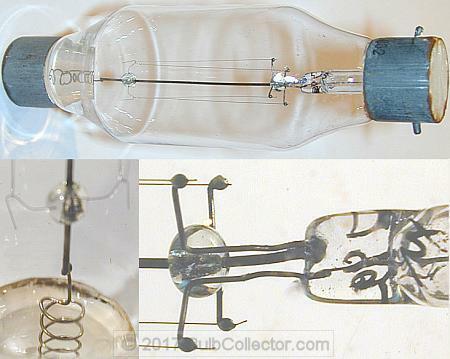 The filament assembly is supported by the glass stem, while a coil shaped wire supports the opposite end of the assembly and also carries electricity to the filament. This lamp had a special purpose, but that purpose is currently a mystery. This lamp is most likely European. The endcaps are made of steel.